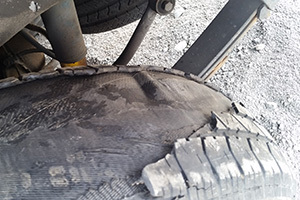 Many tire failures, tire blowouts, defects or tire tread separations can lead to a sudden loss of control of the vehicle especially at highway speeds. When a driver of a SUV, truck or even a passenger car is faced with an unexpected tire failure, then often the driver in an effort to control the vehicle and bring it under control, may incorrectly apply the brakes or steer the vehicle, resulting in what police investigators called over-steering or over-correction. When this happens the vehicle may go out of control as the driver loses directional stability, the vehicle will often crash or roll over. Milliseconds before a rollover occurs as the vehicle is traveling sideways or yawing, the tire’s sidewalls are perpendicular to the direction of the vehicle’s movement and when this happens the tire can deflate from the side pressure and the tire rim then digs into the pavement and the vehicle can “launch” and start the rolling over. A rollover can also occur if the vehicle loses control and travels into the median, onto the shoulder or off the pavement into the grass or dirt and travels sideways. The rollover accident will start when the side resistance is too much pressure on the tire’s sidewalls causing a deflation. In a rollover accident many other safety devices may also come into play including rollover or side curtain airbags, frontal airbags, seatbelts that lock and hold the occupant in place, roof supports that withstand failing or crushing into the vehicle’s interior and door locks and door latches that stay locked during a rollover. When any one of these safety systems or vehicle designs fail, then the occupant may be critically injured or killed from an ejection, roof crush or from being partially ejected out of the vehicle. In a rollover accident due to a tire failure or tire defect, it is important that an accident investigation start soon after the accident, while evidence at the scene of the accident is still undisturbed. 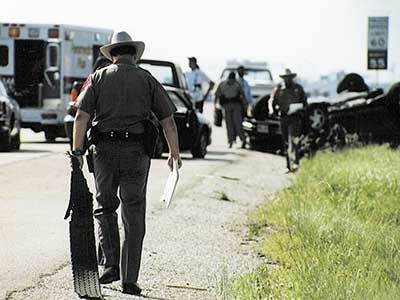 In many tire failure rollover accidents, pieces of the defective tire or tread can still be found at the accident site. It is critical that all evidence be documented, surveyed and collected for evidence. Tire defects and tire failures account for a high percentage of the initial start of a rollover. This is especially true when the vehicle is a sports utility vehicle (SUV), van or a truck. These vehicles can be especially susceptible to rolling over due to the higher center of gravity, narrow track width and shorter wheelbase. 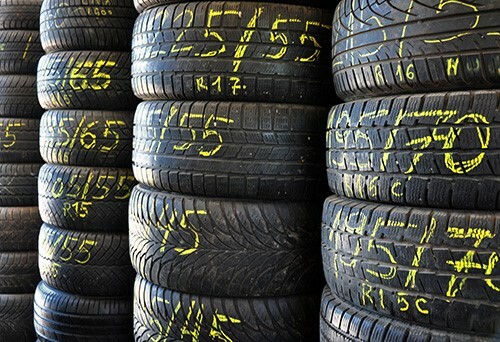 In a tire defect accident a thorough tire history needs to be conducted early on in order to help determine if an earlier tire purchase, tire repair or tire rotation could be partially responsible in causing the tire to fail or blowout. Too old of tires are often the cause of a tread separation even with sufficient tread remaining on the tire. Many vehicles bought used may have undersized, mismatched or older or aged tires on the vehicle. In those cases the prior seller or used car dealer may be at fault. In other cases the tire repair shop may be negligent is failing to properly rotate the better tires to the rear of the vehicle, making dangerous tire repair to an old tire or failing to warn you that the tires were old, unsafe and not roadworthy and should be replaced. In other tire failure rollover accidents, the tire manufacturer themselves may be at fault for manufacturing inferior tires that will not withstand normal use without failure. In some tire failures, the tire’s design itself is the reason for an early tire blowout or failure. Either way, our law firm can be of great assistance to you or your family in properly investigating the accident and helping to secure and preserve the vehicle and tire. If you have been injured or have tragically lost a loved one in an SUV or truck rollover accident that was caused by a defective tire, blowout or tire failure, we can help you. After 33 years of tire and rollover experience, Mr. Willis is highly skilled on knowing what needs to be done to protect his clients and preserve the evidence so that a team of rollover and tire experts and engineers can help prove a product defect lawsuit for you. Willis was one of the lead lawyers on Jackson vs. Ford Motor Company and Firestone Tire Co. one of the nation’s very first Firestone tire tread separations and Ford Explorer rollover cases. It was through that case important documents and evidence was uncovered and later shared with NHTSA and other auto safety, tire and rollover experts. For his help, Willis was presented the National Steven J. Sharp Public Service Award for his work and contributions that lead the to the largest tire recall in history. To learn more about your legal rights and the potential benefits of a product liability lawsuit, contact the tire failure and tire defect lawyers at the Willis Law Firm at 800-883-9858.